Would MLK honor Angela Davis? In the Arguable e-mail newsletter, columnist Jeff Jacoby offers his take on everything from politics to pet peeves to the passions of the day. Sign up here. Each year the Birmingham Civil Rights Institute bestows its highest honor on a recipient who embodies the legacy of one of Alabama’s 20th-century heroes: the fearless, fiery Birmingham pastor Fred L. Shuttlesworth, a co-founder of the Southern Christian Leadership Conference and one of the giants of the US Civil Rights Movement. Among the award’s past recipients have been Georgia Congressman John Lewis, former Ambassador Andrew Young, and Vernon Jordan Jr., all of whom played significant roles in the struggle for equal rights. Retired US Marine General Charles Krulak, a Birmingham resident and the former commandant of the Marine Corps, publicly voiced his “sadness” at the selection of someone with Davis’s ugly record for a civil-rights honor. The Birmingham Jewish Federation wondered publicly why someone who “marginalizes and devalues Jewish lives” should be celebrated. Baptist pastor John Killian Sr. said he was “appalled” by the choice of Davis for the award. To its credit, the institute took the criticism to heart. On Jan. 4, it announced that it had reconsidered its decision and would not honor Davis after all. It cancelled the gala dinner at which the Shuttlesworth Award was to be presented. Then it battened down the hatches for the inevitable backlash. Davis herself took to Facebook to declare that in rescinding the award, the Birmingham Civil Rights Institute had committed “an attack . . . against the very spirit of the indivisibility of justice.” The city’s mayor, Randall Woodfin, said he was “dismayed,” and blamed the decision on Jews (“protests from our local Jewish community and some of its allies”). Stephen Zunes of the left-wing Institute for Policy Studies attacked the about-face as “cowardly and unfair.” This being the age of social media, a Twitter crowd promptly mobilized around the hashtag #IStandWithAngela to defend Davis and attack the institute. But however voluble Davis’s defenders may be, they cannot wash away her terrible record. By then, Davis . . . was a card-carrying Communist and a supporter of the Black Panther party. She was accused of helping engineer a hostage-taking in a California courtroom intended to free three Black Panthers accused of killing a white prison guard. Davis had bought several of the firearms used in the attack, in which the judge and the three defendants were killed and several other people were injured. Support for violent killers has been a leitmotif throughout Davis’s career. She was a strong supporter of Jim Jones, who engineered the mass suicide of his Jonestown cult in Guyana. She championed the cause of Marwan Barghouti, a Palestinian terrorist boss serving five life terms for his role in the murder of Israeli civilians, and of Rasmea Odeh, convicted in 1969 of a Jerusalem bombing that left two students dead. Davis had visited East Berlin and Cuba in the late 1960s and had come to admire those regimes. During her imprisonment, she became a political celebrity in the Soviet bloc; communist states that faced frequent international criticism for imprisoning dissenters got a lot of propaganda mileage out of championing a reputed political prisoner in the United States. Upon her release, Davis traveled to East Germany, Cuba, and the USSR to a hero’s welcome; she received honorary degrees, awards, medals, and prizes, and gave speeches praising her hosts. On her trip to East Germany, Davis visited the Berlin Wall, where 262 people were killed trying to escape from communist paradise to capitalist hell. A 1972 photo shows her glowing as she shakes hands with Erich Honecker, the General Secretary of the East German Communist Party who gave orders to shoot at escapees. There’s a certain woman here named Angela Davis. I don’t know if you are familiar with her in this country, but in our country, literally for one whole year, we heard of nothing at all except about Angela Davis. There was only Angela Davis in the whole world and she was suffering. We had our ears stuffed with Angela Davis. Little children in school were told to sign petitions in defense of Angela Davis. Little boys and girls, 8 and 9 years old in schools, were asked to do this. Well, they set her free. Although she didn’t have a rough time in this country, she came to recuperate in Soviet resorts. Some Soviet dissidents — but more important, a group of Czech dissidents— addressed an appeal to her: “Comrade Davis, you were in prison. You know how unpleasant it is to sit in prison, especially when you consider yourself innocent. You now have such authority. Could you help our Czech prisoners? 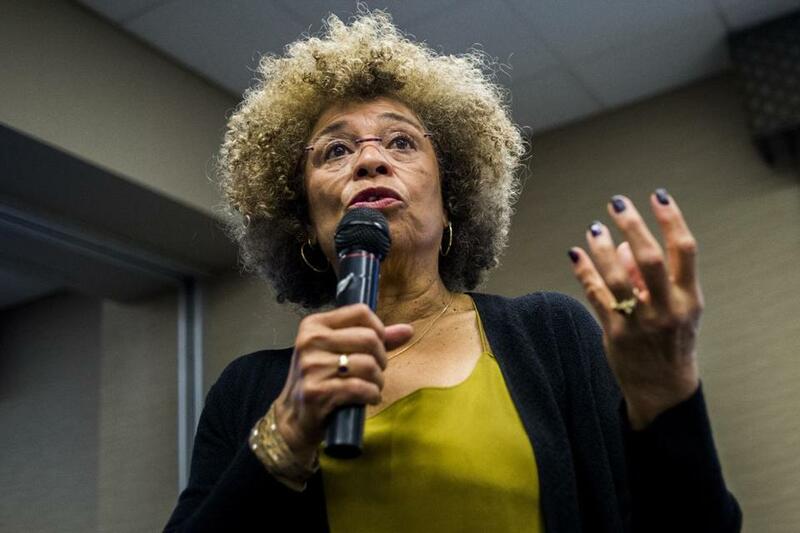 Could you stand up for those persons in Czechoslovakia who are being persecuted by the state?” Angela Davis answered: ‘They deserve what they get. Let them remain in prison.’ That is the face of communism. Alan Dershowitz recorded a similar experience. The well-known defense lawyer had been a volunteer consultant for Davis’s legal team when she was charged as an accessory to murder in California. Some years later, upon hearing that Davis was going to Moscow to be feted by the Soviet government, he asked her to speak to Soviet authorities on behalf of several Jewish refuseniks — prisoners of conscience consigned to the Gulag for the crime of studying Hebrew or wanting to emigrate to Israel. All these years later, there has been no letup in Davis’s hostility for Israel, the only free democracy in the Middle East. She is an outspoken supporter of the BDS (Boycott, Divestment & Sanctions) movement that promotes economic warfare against the Jewish state, the modern-day equivalent of the Nazis’ economic warfare against Jews in the 1930s. Davis libels Israel, one of the world’s most racially diverse nations, as a segregated apartheid state. Given Davis’s anti-Israel bile, it’s hardly surprising that several of Birmingham’s Jewish communal leaders were revolted when she was chosen to receive the Shuttlesworth award. But you don’t have to be Jewish to recognize that anti-Zionists — those who deny the right of the Jewish people to a Jewish state in the Jewish homeland — are anti-Semites. Martin Luther King Jr. recognized it too. “The whole world must see,” King said in a filmed 1967 interview, “that Israel must exist — and has the right to exist — and is one of the great outposts of democracy in the world.” It was a message he repeated just 10 days before his assassination. On March 26, 1968, King was a guest of honor at the national convention of the Rabbinical Assembly of Conservative Judaism. During a Q-&-A about foreign policy, King was asked whether black American intellectuals should support Israel in its conflict with the Arab world. Nine months after the Six-Day War, at a time when some on what was being called the New Left were turning against Israel, King reiterated his ardent support for the embattled Jewish country. America’s ultimate “civil rights icon” wasn’t only a prophet of black civic equality. He was also a passionate believer in America’s potential for decency and goodness, a devoted exponent of nonviolence, and a staunch foe of anti-Semitism. The Birmingham Civil Rights Institute would have betrayed King’s deepest convictions by honoring Angela Davis, who in so many ways has spent her life working to undermine values King upheld. To admit its blunder took courage and integrity. King and Shuttlesworth would have been proud. On January 19, 1989, on his last full day as president, Ronald Reagan presented the Presidential Medal of Freedom to two renowned American public servants — Democrat Mike Mansfield, the former Senate majority leader and US ambassador to Japan, and Republican George Shultz, an economist who held four Cabinet-level positions, including six and a half years as Reagan’s secretary of state. In his speech that day — the final speech of his presidency — Reagan returned one last time to a signature theme of his political career: the blessing of immigration. Amid the current Washington struggle over the 45th president’s demand for a massive wall on the southern border to keep unwanted immigrants out, it’s worth taking a moment to recall our 40th president’s very different attitude toward the foreigners who stream to America. Since this is the last speech that I will give as President, I think it's fitting to leave one final thought, an observation about a country which I love. It was stated best in a letter I received not long ago. A man wrote me and said: “You can go to live in France, but you cannot become a Frenchman. You can go to live in Germany or Turkey or Japan, but you cannot become a German, a Turk, or a Japanese. But anyone, from any corner of the Earth, can come to live in America and become an American. Yes, the torch of Lady Liberty symbolizes our freedom and represents our heritage, the compact with our parents, our grandparents, and our ancestors. It is that lady who gives us our great and special place in the world. For it's the great life force of each generation of new Americans that guarantees that America's triumph shall continue unsurpassed into the next century and beyond. Other countries may seek to compete with us; but in one vital area, as a beacon of freedom and opportunity that draws the people of the world, no country on Earth comes close. This, I believe, is one of the most important sources of America's greatness. We lead the world because, unique among nations, we draw our people — our strength — from every country and every corner of the world. And by doing so we continuously renew and enrich our nation. While other countries cling to the stale past, here in America we breathe life into dreams. We create the future, and the world follows us into tomorrow. Thanks to each wave of new arrivals to this land of opportunity, we're a nation forever young, forever bursting with energy and new ideas, and always on the cutting edge, always leading the world to the next frontier. This quality is vital to our future as a nation. If we ever closed the door to new Americans, our leadership in the world would soon be lost. “I had to,” he said, “the war ended.” The man had been in America as a German prisoner of war. Now, I don't tell this story to make the case for former POW's. Instead, I tell this story just to remind you of the magical, intoxicating power of America. We may sometimes forget it, but others do not. Even a man from a country at war with the United States, while held here as a prisoner, could fall in love with us. Those who become American citizens love this country even more. And that's why the Statue of Liberty lifts her lamp to welcome them to the golden door. It is bold men and women, yearning for freedom and opportunity, who leave their homelands and come to a new country to start their lives over. They believe in the American dream. And over and over, they make it come true for themselves, for their children, and for others. They give more than they receive. They labor and succeed. And often they are entrepreneurs. But their greatest contribution is more than economic, because they understand in a special way how glorious it is to be an American. They renew our pride and gratitude in the United States of America, the greatest, freest nation in the world — the last, best hope of man on Earth. You can read Reagan’s entire speech here, and watch a video excerpt here. One way or another, the current impasse in Washington will be broken. Eventually the Trump administration, like all presidential terms, will end. I don’t know if Trump will get his wall. But I do know that if he does, America will have lost more than it can possibly gain. For immigration is the essential growth hormone of our history; it is the indispensable ingredient in the formula of national greatness. The construction of a vast barrier to deter would-be newcomers would have horrified the Gipper. The finest president of my lifetime believed not in closed walls but in open doors, wide and welcoming. Reagan’s party may have forgotten that this is an ideal it used to stand for. Most of Reagan’s countrymen, I hope, have not. Amid the internet’s vast ocean of drivel, some websites are alluring islands of knowledge and discovery. Each week, in “Site to See,” I call attention to one of these online treasures. This week’s Site to See should gladden the heart of any royalist. English Monarchs [URL: http://www.englishmonarchs.co.uk/index.htm] is intended to “bring to life, as vividly as possible, the history of the Kings and Queens of England” — from the 9th century Saxon King Egbert, the first monarch to rule all of England, to the current sovereign, Elizabeth II of the House of Windsor. The website covers the descent of the nation’s royalty through its successive dynasties — Vikings and Normans, Yorks and Tudors, Stuarts and Hanovers. It tells the story not just of England’s most famous monarchs, like William the Conqueror and Henry VIII, but of those whom few laymen know — Edwy the Fair, for example, who reigned from 955 to 959, or the Empress Matilda, whose claim to the throne sparked a bloody 12th-century civil war with her cousin, Stephen of Blois. No other ruler in England’s long and varied history has been honored with the title “The Great.” Alfred once declared it his intention “to live worthily as long as I live and after my life to leave to them that should come after, my memory in good works.” Few of our monarchs have succeeded as spectacularly in their aims as he did. . . .
Alfred was around 11 when his father died. He was studious as a child and grew to be a man of determination, intelligence, and resolution, despite suffering from ill health for much of his life. Alfred’s three elder brothers reigned in turn before him. During the reign of the youngest of these, Ethelred I, Alfred emerged from the mists of obscurity to fight loyally by his side in the struggle against the Danish incursions into Wessex. At the Battle of Ashdown, in the Vale of the White Horse, the pious Ethelred remained so long in his tent praying for victory that Alfred became impatient and led his men in a furious charge at the enemy without waiting for his brother to finish his prayers. The Witangemot, or Saxon council of wise men, met after Ethelred’s death from wounds sustained in battle and elected the 22-year-old Alfred, who had already demonstrated himself a confident leader of men, as king. As a decidedly (small-r) American republican, I tend to agree with Huck Finn that “all kings is mostly rapscallions.” Still, even rapscallions can be well worth reading about. Recommend a website for this feature! Please send me the link and short description: jeff.jacoby@globe.com), and put “Site to See” in the subject line. My Sunday column was about a new movie, “The Upside,” in which Bryan Cranston plays a wealthy quadriplegic. The casting of Cranston for the role triggered objections in some quarters, with critics saying the role should have gone to an actor who is disabled in real life. Similar complaints have been made about non-Asian actors taking on Asian roles, non-gay actors portraying gay characters, non-transgender actors being cast as transgender, etc. Such complaints are misguided. An actor’s job is to embody a role and bring it believably to life, and if actors must stick to characters who are just like themselves, the deepest possibilities of drama will be lost. I wrote last Wednesday’s column after seeing US Census Bureau data that, for the third year in a row, the number of Americans commuting to work by bicycle was down. Tens of thousands of cyclists seem to be having second thoughts about using bikes to get to work, I wrote — perhaps because even they are coming to realize that subtracting or squeezing already-crowded car lanes for the benefit of cyclists makes travel more difficult and dangerous for everyone.